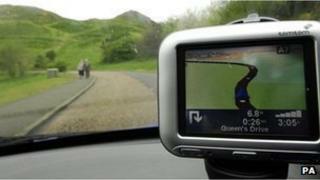 Navigation system firm TomTom has seen a 76% drop in fourth-quarter profit, hit by falling demand for its devices. Net profit fell to 12m euros ($16m; £10m) from 52m euros a year earlier, as the company reported lower sales and took a previously announced charge of 13.9m euros in the quarter. Total revenues fell 31% to 357m euros, while consumer sales fell 40%. In December, the Dutch firm said it was cutting 10% of its workforce as part of a 50m-euro cost-cutting drive. TomTom has struggled for months with slumping demand for its personal navigation devices (PNDs), which account for half of its total sales. It increasingly sells them built into car dashboards. It has faced competition from free navigation software on smartphones and tablet computers. TomTom also sells live traffic services for internet-connected devices and smartphone apps - an area where it has also had to compete with the likes of Google. "The visibility in our core PND markets is limited, as there remains great uncertainty about the rate of decline of customer demand for the category in the year ahead," the company said in a statement.